Merimbula, the holiday playground of the Sapphire Coast located approximately half way between Sydney and Melbourne on the South Coast of NSW. Come and unwind at Anchorbell, a family oriented, spacious, clean and affordable holiday apartment complex, made up of 2 & 3 bedroom fully self contained townhouses and apartments with onsite carport or lock up garages. All linen & towels supplied. Relax in our solar heated pool, have a b.b.que or a game of tennis on our half size tennis court .Raquets & balls provided. We're centrally located, 5 min flat walk to clubs, shops, restaurants and the beach. Max. occ. is 4. Linen and towels supplied. Fully self contained with free Austar TV. Solar heated pool, half tennis court and BBQ area. 5 min. walk to shops, clubs and beach. Max. occ. is 5. Linen and towels supplied. Fully self contained with free Austar TV. Solar heated pool, half tennis court and BBQ area. 5 min. walk to shops, clubs and beach. Max. occ. is 6. Linen and towels supplied. Fully self contained with free Austar TV. Solar heated pool, half tennis court and BBQ area. 5 min. walk to shops, clubs and beach. Wifi internet access and fax facilities are available. All Townhouses have their own lock-up garages All apartments have their own carports. There is ample room for a boat/trailer. We are the 3rd property on the right hand side. Anchorbell Apartments are ideally located within easy reach of the best Merimbula has to offer. A 5 min flat walk to the shops, beach, restaurants and clubs. Enjoy the natural beauty of the area with a great climate & pristine beaches. 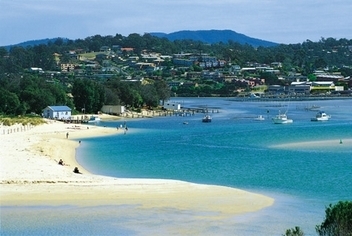 Attractions from golf to lawn bowls, surf & swimming beaches, whale watching, deep sea fishing, art & craft galleries, walking trails, hiking, wildlife park, amusement park, aquarium, wineries, side walk cafe's, great restaurants, specialty shops, festivals & markets will make your Merimbula holiday a perfect getaway.